Ukraine’s Sergey Lebid defied father time and 74 other runners to take a record ninth title at the SPAR European Cross Country Championships on Sunday (12). However, despite that astonishing feat, the biggest cheers were definitely reserved for local heroine Jessica Augusto, the Portuguese women finally adding a senior women’s gold medal to the one she won as a junior a decade ago in 2000. The first time Lebid led in the senior men’s 9870m race was 300m before the line but when he got in front there was little doubt about the outcome. His famed kick on the continental stage has not diminished over the years and he won in 29:15. 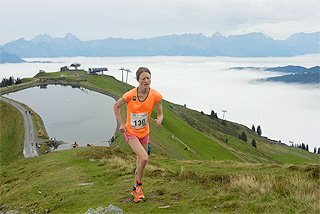 Lebid, now 35, is also the only runner to have competed in every single SPAR European Cross Country Championships since they were established in 1994. “This was almost the perfect race for me. 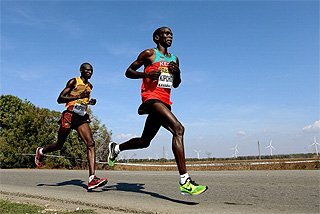 I was at 99 per cent apart from a slight stomach discomfort in the middle of the race, it’s always my stomach,” commented Lebid. The race for the medals started seriously at the bell with six men still together. 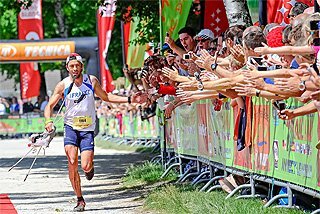 Spain’s Ayad Lamdassem made a move with a kilometre to go and shook off everybody apart from, ominously Lebid. “I knew when Lamdassem pushed and we were on our own that I could win. 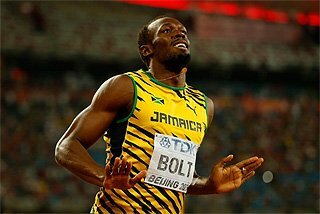 I have seen him do this before from a long way out and I knew I was faster than him over the final 400 metres. My confidence was helped by the fact that this year I’ve changed my training around and I have done more speed work. 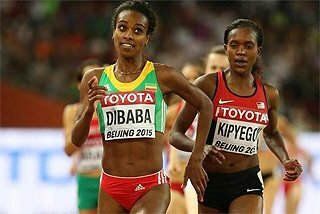 I also had my first good season on the track after three bad years,” added Lebid, who finished fourth in the 2010 European Athletics Championships 5000m. Lamdassem hung on to claim the silver medal, after finishing fifth in Dublin 12 months ago, in 29:18 while Portugal’s Youssef El Kalai, who had surged at the start of the last lap to test his rivals, won an exciting battle for the bronze in 29:19. 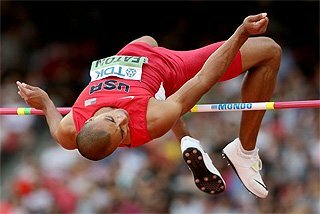 France’s Morhad Amdouni and Abdellatif Meftah came home fourth and fifth respectively but had the compensation, after just missing out on an individual medal, of helping France regain the team title they last won in 2006 with a total of 33 points. Augusto gave the home crowd what they wanted after four earlier races without a Portuguese victory with one of the most dominating performance seen at this event in recent years, easing away from the rest of her rivals in the second half of the race. 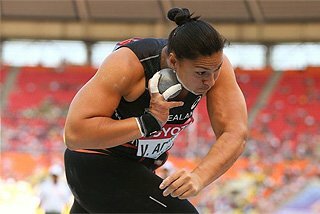 There was enough daylight between herself and Turkey’s silver medallist Binnaz Uslu in the home straight to allow her the time to blow kisses to the ecstatic local audience and slow to a stroll 10 metres from home. “I would like to dedicate this victory to everyone who has come here today and made these championships a success, and especially to my mother whose arrival here is a huge surprise,” said the stunned Augusto, who fell to her knees and kissed the ground after she had crossed the line in 26:52. 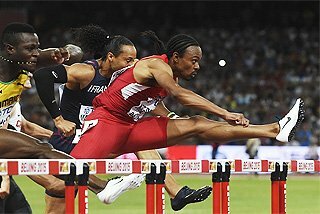 Uslu came home five seconds behind over the 8170m course with another Portuguese runner Dulce Félix finished third, a further three seconds behind the Turk. Portugal had four women in the top nine to comfortably retain their senior women’s team title with just 19 points. 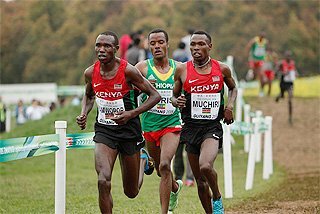 “Hassan Chahdi and Florian Carvalho were second and fourth respectively last year in the under 23 men’s race and have a very good chance of fighting for the individual title again,” said French federation head cross country coach Philippe Dupont last week. He proved to be remarkably prescient. Chahdi ultimately got the upper hand over his compatriot Carvalho after an enthralling battle over the last 1500 metres before they took the gold and silver medals respectively. The former had pushed the pace during the penultimate lap of four long ones during the 8170m race but at the bell there were still five men together. However, shortly after embarking on the final circuit, Chahdi put in another surge which had the effect of shaking off two of his rivals although Carvalho and Russia’s Yagar Nikolayev stayed in his shadow. Chahdi then pushed again 400 metres from the line to seal victory over Carvalho, the 2008 junior men’s winner, with Nikolayev becoming the first Russian man to get a medal at the Championships since 2007 by coming home third. The winner was timed at 24:11 with his team mate coming home three seconds in arrears. Norway’s 2009 junior champion Karoline Bjerkeli Grøvdal was sadly a late withdrawal and her absence left Turkey’s Meryem Erdogan as the overwhelming favourite and the 20 year-old Ethiopian-born runner didn’t disappoint. 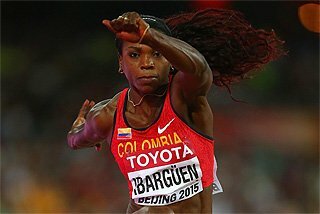 She hit the front just before the halfway point of the 6070m race and was never headed. Erdogan, who was fifth in the 2010 European Athletics Championships 10,000m in 31:44.86, the fastest time over 25 laps of the track by a European under 23 runner, finished in 20:08 to follow in the footsteps of her fellow Turks, the 2006 and 2009 under 23 women’s gold medallists Binnaz Uslu and Sultan Haydar. Spain’s Cristina Jordán got the silver medal, eventually coming home nine seconds behind Erdogan, after a fascinating mid-race duel with Great Britain’s Emma Pallant. The pair swapped second and third places until the Spaniard pulled away midway through the final lap. To whet the appetite for next year’s SPAR European Cross Country Championships, all three medallists will be eligible to run again in the under 23 race when the event is staged in Velenje, Slovenia, in 12 months time. Abdelaziz Merzougui became just the second Spanish junior, following in the footsteps of Yusef El Nasri in 1998, to win at the championship, breaking a 12 year medal drought in the men’s race since El Nasri triumphed in the Italian city of Ferrara. Merzougui, the Spanish junior 3000m Steeplechase record holder and fourth at this summer’s IAAF World Junior Championships in his specialist event, prudently stayed on the shoulder of whoever was leading until 600m from the line. He then sprinted away from his rivals, eventually covering the 6070m course in 18:07. Serbia’s silver medallist Nemanja Cerovac, who was seventh in Dublin 12 months ago and who made the 1500m final at the World Junior Championships in Canada, spiritedly chased Merzougui off the final bend and was given the same finishing time but the Spaniard had everything clearly under control and was never seriously under threat over the final 100 metres. Despite not getting a man in the top 10, Great Britain packed well enough to take the team title with 63 points. After finishing third three years ago as a 16 year-old, second in 2008 but missing last year’s Championships because of injury, Great Britain’s Charlotte Purdue finally made it to the top of the junior podium after her four year journey. Purdue was always part of the leading group but threw down the gauntlet at the start of the final lap and no one could respond to her challenge. 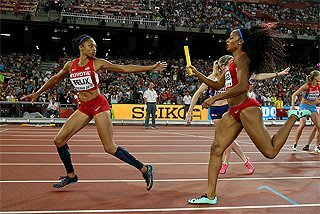 The British woman gradually extended her lead before crossing the line over 100 metres clear of her nearest challenger. Purdue stopped the clock at 12:42 after 3970m of running with Serbia’s silver medallist Amela Terzic, the 2009 IAAF World Youth Championships 1500m bronze medallist, finishing 17 seconds behind. Emelia Gorecka finished in third place and, with two medallists to their name, Great Britain comfortably regained the team medals they relinquished to Russia last year in Dublin, notching up just 23 points. Lily Partridge and Annabel Gummow also finishing in the top 10 to secure their country’s fourth junior women’s team title in the last five years. 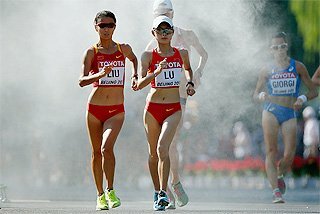 Many of those runners in action on Sunday will return to the south of the continent for the 2011 IAAF World Cross Country Championships, which will be held on March 20 next year just over the border in Punta Umbria in Spain, little more than an hour’s drive along the coast from Albufeira.